Earlier this spring, I had the opportunity to smack my thespian chops in Dante Ambriel’s radio play, a musically driven drama, Broken Angel. I say radio play in that we performed it on stage on Denman Island as if we were in a radio studio. Mine was a small role befitting my modest theatrical talents. Dante and her partner, Tashi Draper, who is producing the festival, are truly creative souls who perform at a high level in a range of artistic arenas. Out of that experience came the threat (or maybe I mean the treat) of more, bigger, and possibly better, ideas. 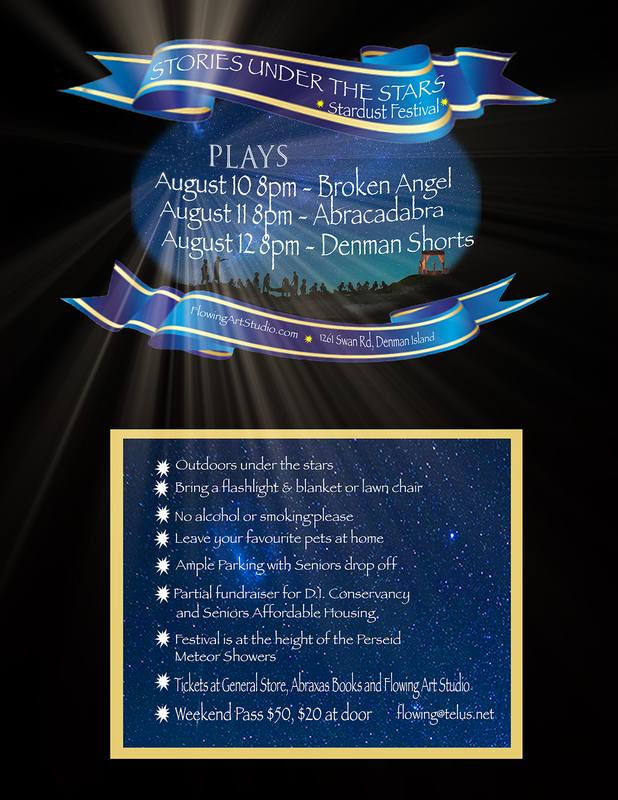 One was a festival of plays on Denman. The festival is on. Stories Under the Stars-The Stardust Festival. Three nights, August 10th, 11th, and 12th, of locally written theatre, performed in the outdoors in a natural amphitheatre on the large homestead of Dante and Tashi. 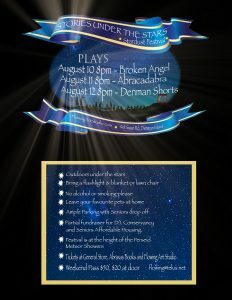 On the first night, the original cast of Broken Angel will repeat the experience. This, of course, is by popular demand. On the second night, Dante will premiere her new play, a romantic comedy, Abracadabra. 4. Yup. You guessed it. At Home with The Trumps by Yours Truly. My little play is a compilation of three previous flash fiction stories and a fourth story written to tie my crazy, scattered Donald threads together into a semblance of a hoot and a holler whole. The result is a short, sharp tapestry of Trumpetry woven into a spirited, satirical overview of the grimacing presidential reaper to the south of us. Will this spur me on to further playwrightian experiences? Decades ago, in 1980 or thereabouts, I did write (or really, assemble the product of a group workshop.) That work, Care-osel, or Care-ousel) portrayed the life of a Child who comes into the care of the State. A host of social workers, childcare workers, youth in and out of state care and others had come together to grieve over the death of a young man whilst in custody at the Willingdon Youth Detention Centre in Burnaby BC. One of the by-products of that grief was a short, hopefully entertaining, twenty-minute play that was performed on a number of occasions. Now, after all these years, a second effort. Okay, it’s more of a skit. While I think it is funny, it isn’t deep. It’s difficult to dig deep when Trump is your creative gold mine. Anyways, I am comforted that my small effort is encased in, and surrounded by, the significant skills of others. “At Home with the Trumps” sounds like a hilarious wrap-up what I’m sure will be a sold-out weekend of entertainment.